Throughout history, change, particularly that defined by radical hues, has never failed to corral the masses to action and overpower the systems that fall short of keeping tabs on the pulse of the proletariat. Bismarck stood upon the pulpits of such change and is now inducted into the history hall of fame for his pivotal role in the unification of Germany. Winston Churchill’s radicalism deracinated the complacency of British politics and changed the machinations of the second World War. Each generation births a leader with an inherent cocktail of passion, fire, fury, outrage, veracity, wisdom, and charisma that burrows into the desire of the masses to change the politics as usual that threatens progress, and many are convinced Barack Obama is the primogeniture of this ilk of leadership for this generation. The American people seem overtaken by a yen to grasp at hope. 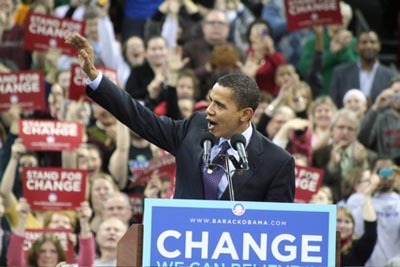 It is evident – by the remarks of thousands of Americans who turn out for the Presidential primaries – they are ready to embrace Obama and his riveting change campaign; the lynch-pin of his promises of stability, socio-political restoration, and a renaissance of unity. So entrenched is this yearning for a new order that for the first time in the politics of America, people are spending less time to deign the ways in which Obama’s position on the pigmentation continuum will skew their support. Instead, Americans, like the frustrated French under Louis XIV, are paying attention to the message of change and solidarity; their vehicle to a rebirth of the American dream, fast becoming a distant glimmer for many vexed by the mangled Bush administration. Obama’s appeal is to an America that many have never seen. One that seems interested in losing the institutions of definitions that hyphenate their identities and perpetuate a widening of the gaps of intolerance. That this phenomenon may soon meet a quick death may be valid, but even more worthy of note is that this phenomenon seems possible and is becoming tangible with each Obama victory. The campaign of the Illinois senator seeks to safeguard the bastions of democracy that disregard unilateral, ill-advised actions like the Iraq war. And people, not only Americans, are applauding this position. The protracted, fundamental errors, after five years continue to spew from the Iraqi war. The unwise intervention, seated in an unclear narrative behind dispatching young soldiers to the line of fire in Iraq is the main source of discontent world over. The Americans are not the only ones who are “waiting on the world to change,” the world is waiting for this change and Obama is the only candidate speaking unequivocally to this change. The great American democracy received some battering in recent times, and there still exist lacerations and to some degree, lacunas in its imperial dogma. Are these wounds too infested to recover from Obama’s change panacea? Is America the Ottomans facing the historical inevitable? Indeed, the history of mankind is encumbered with an interminable number of lessons from which to glean insight into the ubiquitous “law”: any phenomenon, idea, institution which rises to a position of supremacy, will, in time, meet its demise. Established as a political rhetoric spanning more than six centuries, the Ottoman Empire failed to escape the “law” and eventually succumbed. Centralized control of a vast population encompassing most of Eastern Europe, Central Asia, North Africa, and boundaries extending tentacles into three continents could not stand as bulwark against the ultimate. The Ottomans, like the Holy Roman and Byzantine Empires before, lost grip on the reins of a notable political momentum and came to a stagnating halt. “Nothing is more powerful than an idea which has found its time, and one can say with a degree of certainty that Obama and his ideas just discovered their home…” Nothing is more powerful than an idea which has found its time, and one can say with a degree of certainty that Obama and his ideas just discovered their home in this juncture of hopelessness in American history. But the Ottoman, as well as the empires it followed, epitomized expert timing in promulgating ideas that revved up support – conquest and expansion. Ideas however, experience a unique life cycle and very few possess the recipe to withstand the winds of change attendant to the rise and fall of eras. It seems the Democratic front-runner is pitching ideas with evidence of intelligent rumination, and the potential for perdurable relevance to this and many generations to come: from gay rights, fuel efficiency, immigration solutions, creative border garrison machinery to leveraging global strategy through technology and net neutrality. Fred Thompson, a dropped-out Republican contender, fumbled on the question of internet neutrality and Ron Paul seems unschooled on the topic. Hilary’s agenda is a text book sample. Everyone has seen it before, and apart from perpetuating the virtues and tenacity of the underdog, she does not exude the trappings of the genre of leadership that will engine the hurricanes of change that Americans need to see in Washington. Additionally, not many are keen on investing their trust in a ‘Billary’ regime. McCain, the apparent Republican choice for the presidency, cannot seem to underline what exactly he stands for, and the logic behind his neo-Republican machinery is found wanting each time it is called into account. Robert Hooke, the 17th Century English philosopher, says a structure, regardless of how sturdy, strong, or mighty it is will crumble if holes are poked at strategic positions that compromise its weight carrying capacity. A four year term or an eight year double term may not be enough for Obama to plug the holes poked into the American supremacy but may be enough to start the process. Obama seems to understand that changes that will stem any further demise must target these specific, compromised areas, and will be ineffectual if applied universally to garnish the entire American wall of power. From historic lessons, it becomes abundantly clear the number attached to the obsolescence of power and supremacy is determined exclusively by their relevance. In the wake of the Modern era, principles at the forefront that governed power and historically defined the essence of that period were more relevant than they were revolutionary. Relevance is the definition of Obama’s political thrust, and explains why he is defying all the odds recorded in the book of political meanderings. Barack Obama says he will unite “ordinary people” to achieve “extraordinary results.” Precedence shows he says what he means and means what he says.